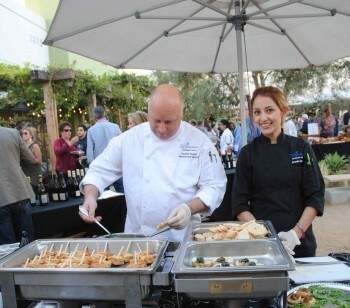 Last month we attended the first annual SOCO Uncorked, a neighborhood wine and food fest in Costa Mesa, California, that was one of the most captivating, upscale and delightful events we have enjoyed in a long time. Sponsored by the South Coast Collection (SOCO) and LCA Wine, this festive gathering was held on a lovely April evening in SOCO’S beautiful, open air courtyard. SOCO is a premier shopping destination that includes more than 70 exquisite designer showrooms, artisan restaurants, food purveyors, and creative boutiques, and is home to Orange County’s largest Farmer’s Market. While this event was wonderful, we were also enthralled by the destination itself and we will be back to browse, shop, eat, and enjoy wine. Located right off the I-405 in Costa Mesa, SOCO is easily accessible from almost anywhere in Orange, LA, San Diego, and Riverside counties. 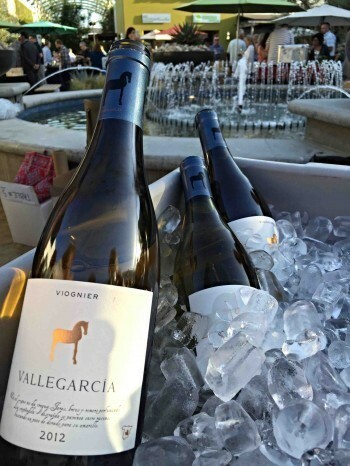 This event was also sponsored by LCA Wine, a wine lover’s mecca that focuses on wine tasting, wine education, and retail wine sales, continuing a tradition that began in Laguna Beach when the company was Laguna Culinary Arts. LCA Wine was founded by Nancy Milby who holds many notable certifications reflecting her wine expertise. Nancy also curated all the wine vendors at SOCO Uncorked. The Neptune School of Wine is adjacent to LCA Wine and was founded by Peter Neptune who is one of only about 125 people in North America to achieve the prestigious title of Master Sommelier. He also holds many other impressive degrees and certifications. 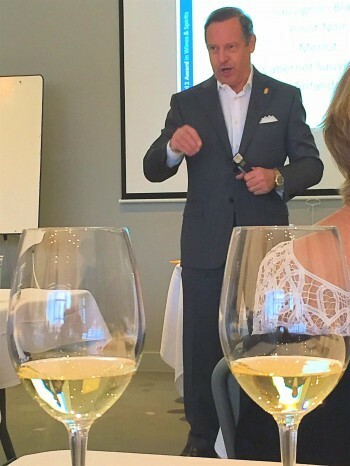 Before the wine and food tasting began, we were fortunate to attend a presentation by Peter titled “Exploring Varietal Typicity.” His presentation was fascinating and entertaining. We learned that “typicity” means the degree to which a varietal reflects the signature characteristics of wine from its origin grapes. We learned what to expect from a range of varietals when they are nurtured in certain locations. Peter explained that the main factors affecting typicity are climate, soil, and winemaking techniques. For instance lees contact (which means wine has fermented on yeast cells) will make a wine creamier with more savory and toasty flavors. And oak aging means the wine will have more of a woody, vanilla, nutty taste. After this enlightening presentation, we adjourned to the courtyard where SOCO restaurants were offering delicious small bites to pair with an impressive variety of wines from all over the world. A stylish crowd had a wonderful time exclaiming over the food as they wandered around with wine glasses in hand. 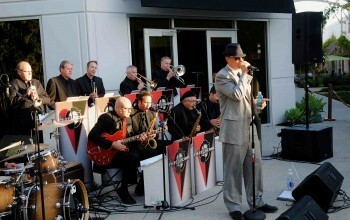 A romantic mood was created by vocalist Matt Mauser from the Tijuana Dogs who performed with a twelve-piece Sinatra tribute band. 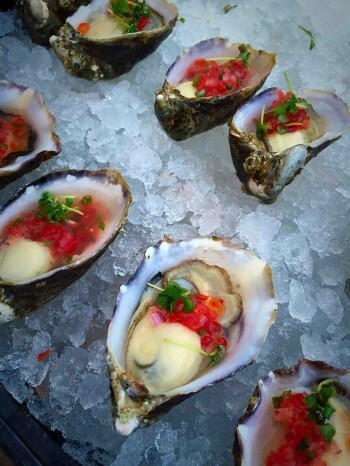 Here is just a sampling of some of the small bites we savored: Shuck Oyster Bar offered us Thai-style oyster ceviche and a luscious, chilled cucumber soup with Meyer lemon and avocado. Greenleaf Gourmet ChopShop, located right in the courtyard, provided scrumptious turkey melt sliders. Arc served several delectable bites, including roasted potato with duck, romesco and cream. Surfas Culinary District, the celebrated kitchen design and supply destination, and their restaurant, Café Surfas, presented zesty Asian-spiced roasted pulled pork. 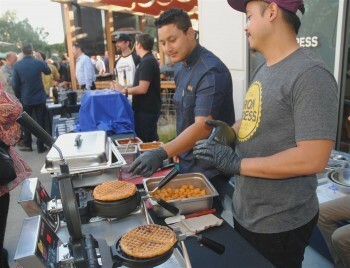 The Iron Press impressed us with unique sumac-spiced gryro waffle sandwiches with roasted tomato jam. Bistro Papillote served classic escargot on a French baguette and a caramelized onion, Dijon tartlet. The Cheese Shop offered a tempting selection of cheese crostinis. 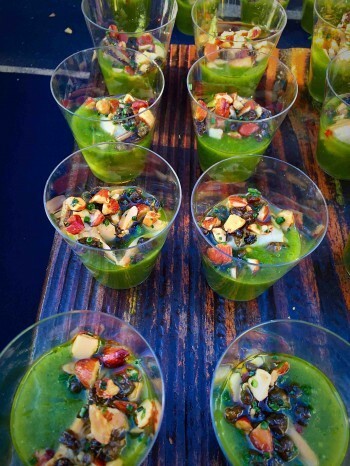 Pueblo featured tomatillo gazpacho with smoked almonds and yogurt. And SusieCakes enticed us with their scrumptious, signature Red Velvet cupcakes. The list of tantalizing tidbits from SOCO restaurants could go on and on. Suffice it to say, everything was innovative and delicious. We certainly were convinced to return to SOCO to try many of their top-notch restaurants. The wines were equally diverse and exceptional. Some of the prominent wineries represented were Gerard Bertrand and Chateau de la Cour from France; Tenuta San Pietro and Azienda Agricola il Roverone from Italy; Tintonegro and Maal Wines from Mendoza; Weingut Dr. Loosen and Weingut Fritz Haag from Germany; Pago de Vallegarcia and Dehasa del Carrizal from Spain; Tablas Creek and Ancient Peaks from Paso Robles; Tres Sabores from Rutherford; Purple Corduroy from Lodi; and Saintsbury from Sonoma. This is just a partial list of the many world-class wines paired with food at SOCO Uncorked. We left satiated in such a wonderful way. We were full of unique flavor combinations and special pairings. I’m so glad this event will be held again next year, but, meanwhile, we intend to spend some quality time shopping and eating at the SOCO Collection. I also hope to take one of Peter Neptune's courses in my efforts to continue to learn about wine. 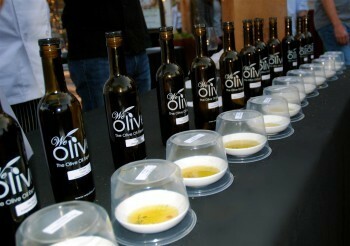 SOCO Uncorkred was presented in partnership with Costa Mesa Visitors’ Bureau and Project Hope Alliance, which benefitted from a portion of the proceeds from the event. Project Hope Alliance is a Costa Mesa-based non-profit organization committed to ending the cycle of child homelessness in Orange County. Photos by Todd Montgomery and Carmen Micheli.